Parshavajra The emptiness of tangible objects appearing in the form of an offering goddess. see Great Treasury of Merit and Guide to Dakini Land. Path/Spiritual path An exalted awareness conjoined with non-fabricated, or spontaneous, renunciation. Spiritual path, spiritual ground, spiritual vehicle, and exalted awareness are synonyms. See also Ground/Spiritual ground ground. See Tantric Grounds and Paths and Ocean of Nectar. Patience A virtuous determination to forbear harm, suffering, or profound Dharma. See How to Solve Our Human Problems. Perfection of wisdom Any wisdom maintained by bodhichitta motivation. See Heart of Wisdom, Joyful Path of Good Fortune, and Ocean of Nectar. Perfection of Wisdom Sutras Sutras of the second turning of the Wheel of Dharma, in which Buddha revealed his final view of the ultimate nature of all phenomena – emptiness of inherent existence. See Heart of Wisdom and Ocean of Nectar. Perfection Vehicle The Mahayana Sutra Vehicle. Performance Tantra See Four classes of Tantra. Permanent phenomenon Phenomena are either permanent or impermanent. A permanent phenomenon is a phenomenon that does not depend upon causes and that does not disintegrate moment by moment. It lacks the characteristics of production, abiding, and disintegration. Person An I imputed in dependence upon any of the five aggregates. Person, being, self, and I are synonyms. See Understanding the Mind. Phabongkha Rinpoche See Je Phabongkhapa. Phenomena source A phenomenon that appears only to mental awareness. This can include form that appears exclusively to mental awareness, such as a dream mountain that appears to a dream eye awareness, which is called ‘form that is a phenomena source’. Phenomena source is also the name given to Buddha Vajrayogini’s mandala, which is symbolic of the source of all phenomena, emptiness. See Understanding the Mind, Ocean of Nectar, and Guide to Dakini Land. Phrase An object of hearing that indicates a meaning by connecting a name with a predicate. See Understanding the Mind. Physical suppleness A light and flexible tactile object within our body that develops when meditation causes a pure wind to pervade the body. Placement meditation Single-pointed concentration on a virtuous object. See Joyful Path of Good Fortune and The New Meditation Handbook. Positive phenomenon See Affirmative phenomenon. Powa See Transference of consciousness. Pratimoksha Sanskrit term for `personal liberation’. See The Bodhisattva Vow. Pratimoksha vow ‘Pratimoksha’ is the Sanskrit term for ‘personal liberation’, and so a Pratimoksha vow is a vow that is motivated mainly by the wish to attain personal liberation. There are eight types of Pratimoksha vow. See The Bodhisattva Vow. Preceptor A Spiritual Guide who give us vows or commitments to observe. Precious human life A life that has eight special freedoms and ten special endowments that make it an ideal opportunity for training the mind in all the stages of the path to enlightenment. See Joyful Path of Good Fortune. Preparatory practices Practices that prepare the mind for successful meditation, such as purifying the mind, accumulating merit, and receiving blessings. 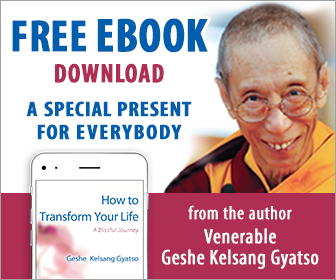 See also Essence of Good Fortune See Eight Steps to Happiness, Joyful Path of Good Fortune and The New Meditation Handbook. Preliminary guide Altogether there are nine preliminary guides, so called because by engaging in them we are guided to the actual spiritual paths of Tantra. The four main ones are: (1) the guide of going for refuge and generating bodhichitta, (2) the guide of meditation and recitation of Vajrasattva, (3) the guide of Guru yoga, and (4) the guide of making mandala offerings. See Guide to Dakini Land. Pretension A deluded mental factor that, motivated by attachment to wealth or reputation, wishes to pretend that we possess qualities that we do not possess. See Understanding the Mind. Pride A deluded mental factor that, through considering and exaggerating one’s own good qualities or possessions, feels arrogant. See Understanding the Mind. Primary mind A cognizer that principally apprehends the mere entity of an object. Synonymous with consciousness. There are six primary minds: eye consciousness, ear consciousness, nose consciousness, tongue consciousness, body consciousness, and mental consciousness. Each moment of mind comprises a primary mind and various mental factors. A primary mind and its accompanying mental factors are the same entity but have different functions. See Understanding the Mind. Profound path The profound path includes all the wisdom practices that lead to a direct realization of emptiness and ultimately to the Truth Body of a Buddha. See Joyful Path of Good Fortune and Ocean of Nectar. Proponents of things The Vaibhashika, Sautrantika, and Chittamatra Buddhist schools are known as ‘proponents of things’ because they assert that things are truly existent. See Ocean of Nectar. Prostration An action of showing respect with body, speech, or mind. See Joyful Path of Good Fortune and The Bodhisattva Vow. Puja A ceremony in which offerings and other acts of devotion are performed in front of holy beings. Pure Dakini Land See Dakini Land. Pure Land A pure environment in which there are no true sufferings. There are many Pure Lands. For example, Tushita is the Pure Land of Buddha Maitreya, Sukhavati is the Pure Land of Buddha Amitabha, and Keajra is the Pure Land of Buddha Vajrayogini and Buddha Heruka. See Living Meaningfully, Dying Joyfully. Purification Generally, any practice that leads to the attainment of a pure body, speech, or mind. More specifically, a practice for purifying negative karma by means of the four opponent powers. See Joyful Path of Good Fortune, The Bodhisattva Vow, Universal Compassion, and Guide to Dakini Land. Rasavajra The emptiness of taste appearing in the form of an offering goddess. See Guide to Dakini Land, Great Treasury of Merit, and Tantric Grounds and Paths. Ratnasambhava The manifestation of the aggregate of feeling of all Buddhas. He has a yellow-coloured body. Realization A stable and non-mistaken experience of a virtuous object that directly protects us from suffering. Re-cognizer A cognizer that realizes what has already been realized through the force of a previous valid cognizer. See Heart of Wisdom and Understanding the Mind. Regret A mental factor that feels remorse for actions done in the past. See Understanding the Mind. Rejoicing A joyful mind, free of jealousy or pride, that takes delight in the virtuous actions of ourself or others. See Meaningful to Behold. Renunciation The wish to be released from samsara. See Joyful Path of Good Fortune. Resentment A deluded mental factor that maintains the continuum of anger without forgetting it, and wishes to retaliate. See How to Solve Our Human Problems and Understanding the Mind. Retreat A period of time during which we impose various restrictions on our actions of body, speech, and mind so as to be able to concentrate more fully on a particular spiritual practice. See also Close retreat. See Guide to Dakini Land and Heart Jewel. Root Guru The principal Spiritual Guide from whom we have received the empowerments, instructions, and oral transmissions of our main practice. See Great Treasury of Merit, Joyful Path of Good Fortune, and Heart Jewel. Guide to the Middle Way a classic Mahayana Buddhist text composed by the great Indian Buddhist Yogi and scholar Chandrakirti, which provides a comprehensive explanation of the Madhyamika-Prasangika view of emptiness as taught in the Perfection of Wisdom Sutras. For a translation and full commentary, see Ocean of Nectar. Root mind The very subtle mind located at the centre of the heart channel wheel. It is known as the ‘root mind’ because all other minds arise from it and dissolve back into it. See Mahamudra Tantra. Rupavajra The emptiness of form appearing in the form of an offering goddess. See Great Treasury of Merit:, and Guide to Dakini Land. Sadhana A ritual prayer that is the special method for attainment, usually associated with a Tantric Deity. Samantabhadra Sanskrit name for ‘All Good One’, a Bodhisattva renowned for his extensive offerings. See Great Treasury of Merit. Samkhya A non-Buddhist school, the oldest of the Brahmaic schools. See Ocean of Nectar and Meaningful to Behold. Samsara The cycle of uncontrolled death and rebirth, or the cycle of twelve dependent-related links. Sometimes known as ‘cyclic existence’. See Joyful Path of Good Fortune. Samsara This can be understood in two ways – as uninterrupted rebirth without freedom or control, or as the aggregates of a being who has taken such a rebirth. Samsara, sometimes known as ‘cyclic existence’, is characterized by suffering and dissatisfaction. There are six realms of samsara. Listed in ascending order according to the type of karma that causes rebirth in them, they are the realms of the hell beings, hungry spirits, animals, human beings, demi-gods, and gods. The first three are lower realms or unhappy migrations, and the second three are higher realms or happy migrations. Although from the point of view of the karma that causes rebirth there, the god realm is the highest realm in samsara, the human realm is said to be the most fortunate realm because it provides the best conditions for attaining liberation and enlightenment. See Joyful Path of Good Fortune. Sangha According to the Vinaya tradition, any community of four or more fully ordained monks or nuns. In general, ordained or lay people who take Bodhisattva vows or Tantric vows can also be said to be Sangha. See Joyful Path of Good Fortune. Sangha Jewel See Three Jewels. Sanskrit vowels and consonants The source of the three letters OM AH HUM, and of all mantras in general, is the sixteen Sanskrit vowels and the thirty-four Sanskrit consonants. The sixteen vowels are: A, AA, I, II, U, UU, RI, RII, LI, LII, E, AI, O, AU, AM, AH. The thirty-four consonants are: KA, KHA, GA, GHA, NGA, CHA, CHHA, JA, JHA, NYA, DA, THA, TA, DHA, NA, DrA, THrA, TrA, DHrA, NA, BA, PHA, PA, BHA, MA, YA, RA, LA, WA, SHA, KA, SA, HA, KYA. Saraha One of the first Mahasiddhas, and the Teacher of Nagarjuna. See Essence of Vajrayana. Sautrantika The higher of the two schools of Hinayana tenets. This school accepts both self-cognizers and external objects to be truly existent. See Meaningful to Behold and Ocean of Nectar. Schools of Buddhist philosophy/tenets Four philosophical views taught by Buddha according to the inclinations and dispositions of disciples. They are the Vaibhashika, Sautrantika, Chittamatra, and Madhyamika schools. The first two are Hinayana schools and the second two are Mahayana schools. They are studied in sequence, the lower tenets being the means by which the higher ones are understood. See Meaningful to Behold and Ocean of Nectar. Secret Mantra Synonymous with Tantra. Secret Mantra teachings are distinguished from Sutra teachings in that they reveal methods for training the mind by bringing the future result, or Buddhahood, into the present path. Secret Mantra is the supreme path to full enlightenment. The term `Mantra’ indicates that it is Buddha’s special instruction for protecting our mind from ordinary appearances and conceptions. Practitioners of Secret Mantra overcome ordinary appearances and conceptions by visualizing their body, environment, enjoyments, and deeds as those of a Buddha. The term `Secret’ indicates that the practices are to be done in private, and that they can be practised only by those who have received a Tantric empowerment. See Tantric Grounds and Paths. Sectarianism At the same time as cherishing our own tradition, we should respect all other traditions and the right of each individual to follow the tradition of their choosing. This approach leads to harmony and tolerance. It is mixing different religious traditions that causes sectarianism. See Understanding the Mind. Seed-letter The sacred letter from which a Deity is generated. Each Deity has a particular seed-letter. For example, the seed-letter of Manjushri is DHI, of Tara is TAM, of Vajrayogini is BAM, and of Heruka is HUM. To accomplish Tantric realizations, we need to recognize that Deities and their seed-letters are the same nature. Seed of delusion The seed of a delusion is the potentiality for that delusion to arise; it is the substantial cause of the delusion. Until we have finally abandoned a delusion, the seed of that delusion will remain within our mind, even when the delusion itself is not manifest. Seeds of delusions can be eradicated only by the wisdom directly realizing emptiness. See Understanding the Mind. Segyu Lineage The lineage of the instructions on Ganden Lhagyäma, or The Hundreds of Deities of the Joyful Land, passed from Je Tsongkhapa to Je Sherab Senge, Paldän Sangpo, Khädrub Sangye Yeshe, and so on down to our present Teachers. This lineage is so called because the original Gurus came from a region of Tibet called Se. See also Hundreds of Deities of the Joyful Land. See Heart Jewel. Self-cherishing A mental attitude that considers oneself to be supremely important and precious. It is regarded as a principal object to be abandoned by Bodhisattvas. See Eight Steps to Happiness and Meaningful to Behold. Self-cognizer A consciousness that experiences itself. See Ocean of Nectar. Self-grasping A conceptual mind that holds any phenomenon to be inherently existent. The mind of self-grasping gives rise to all other delusions, such as anger and attachment. It is the root cause of all suffering and dissatisfaction. See Heart of Wisdom and Ocean of Nectar. Self-satisfaction A deluded mental factor that observes our own physical beauty, wealth, or other good qualities, and being concerned only with these, has no interest in spiritual development. See Understanding the Mind. Sense awareness All minds are included within sense awareness and mental awareness. The definition of sense awareness is an awareness that is developed in dependence upon its uncommon dominant condition, a sense power possessing form. There are five types of sense awareness: eye awareness, ear awareness, nose awareness, tongue awareness, and body awareness. See Understanding the Mind. Sense direct perceiver A direct perceiver that is generated in dependence upon its uncommon dominant condition, a sense power possessing form. See Understanding the Mind. Sense of shame A mental factor that functions to avoid inappropriate actions for reasons that concern oneself. See Understanding the Mind. Sense power An inner power located in the very centre of a sense organ that functions directly to produce a sense awareness. There are five sense powers, one for each type of sense awareness – the eye awareness and so forth. They are sometimes known as `sense powers possessing form’. See Understanding the Mind. Sentient being ‘Sem chän’ in Tibetan. Any being who possesses a mind that is contaminated by delusions or their imprints. Both `sentient being’ and `living being’ are terms used to distinguish beings whose minds are contaminated by either of these two obstructions from Buddhas, whose minds are completely free from these obstructions. Seven limbs Special practices for purifying negativity and accumulating merit. They are prostration, offering, confession, rejoicing, beseeching the holy beings not to pass away, requesting the turning of the Wheel of Dharma, and dedication. They are called `limbs’ because they provide support for the main body of our practice, which is the actual meditations on the paths of Sutra and Tantra. See Joyful Path of Good Fortune and Great Treasury of Merit. Sevenfold cause and effect A method for generating bodhichitta in which affectionate love is developed primarily by recognizing all sentient beings as our mothers and remembering their kindness. See Joyful Path of Good Fortune and Meaningful to Behold. Seven-point posture of Vairochana A special posture for meditation, in which parts of our body adopt a particular position: (1) sitting on a comfortable cushion with the legs crossed in the vajra posture (in which the feet are placed upon the opposite thighs), (2) the back straight, (3) the head inclined slightly forward, (4) the eyes remaining open slightly, gazing down the nose, (5) the shoulders level, (6) the mouth gently closed, and (7) the right hand placed upon the left, palms up, four finger widths below the navel with the two thumbs touching just above the navel. Shamelessness A deluded mental factor that is the opposite of sense of shame. See Understanding the Mind. Shantideva (AD 687-763) A great Indian Buddhist scholar and meditation master. He composed Guide to the Bodhisattva’s Way of Life. See Meaningful to Behold. Shaptavajra The emptiness of sound appearing in the form of an offering goddess. See Guide to Dakini Land and Great Treasury of Merit. Shariputra One of Buddha Shakyamuni’s principal disciples. He has the aspect of a Hinayana Foe Destroyer. See Heart of Wisdom. Sindhura A red powder from any of the Twenty-four Auspicious Places of Heruka. See Guide to Dakini Land. Six perfections The perfections of giving, moral discipline, patience, effort, mental stabilization, and wisdom. They are called `perfections’ because they are motivated by bodhichitta. See Joyful Path of Good Fortune and Meaningful to Behold. Six powers The five sense powers and the mental power. A sense power is an inner power located in the very centre of a sense organ that functions directly to produce a sense awareness. There are five sense powers, one for each type of sense awareness. A mental power is a mind that principally functions directly to produce the uncommon aspect of a mental awareness. See Understanding the Mind. Six realms There are six realms of samsara. Listed in ascending order according to the type of karma that causes rebirth in them, they are the realms of the hell beings, hungry spirits, animals, human beings, demi-gods, and gods. The first three are lower realms or unhappy migrations, and the second three are higher realms or happy migrations. Although from the point of view of the karma that causes rebirth there, the god realm is the highest realm in samsara, the human realm is said to be the most fortunate realm because it provides the best conditions for attaining liberation and enlightenment. See Joyful Path of Good Fortune. Sixteen characteristics of the four noble truths Buddha taught that each of the four noble truths has four special characteristics. The four characteristics of true sufferings are: impermanent, suffering, empty, and selfless. The four characteristics of true origins are: cause, origin, strong producer, and condition. The four characteristics of true cessations are: cessation, peace, supreme attainment, and definite abandoner. The four characteristics of true paths are: path, antidote, accomplisher, and definite abandoning. See Ocean of Nectar. Sixty-two Deities of Heruka There are sixty-two Deities in Heruka’s mandala: six Deities of the great bliss wheel, sixteen Deities of the heart wheel, sixteen Deities of the speech wheel, sixteen Deities of the body wheel, and eight Deities of the commitment wheel. See Guide to Dakini Land. Sleep A mental factor that is developed through dullness or its imprints and that functions to gather the sense awarenesses inwards. See Clear Light of Bliss and Understanding the Mind. Solitary peace A Hinayana nirvana. Solitary Realizer One of two types of Hinayana practitioner. Also known as `Solitary Conqueror’. Both Hearers and Solitary Realizers are Hinayanists, but they differ in their motivation, behaviour, merit, and wisdom. In all these respects, Solitary Realizers are superior to Hearers. See Ocean of Nectar. Spiritual Guide ‘Guru’ in Sanskrit, ‘Lama’ in Tibetan. A Teacher who guides us along the spiritual path. See Joyful Path of Good Fortune and Great Treasury of Merit. Spite A deluded mental factor that, motivated by resentment or aggression, wishes to speak harshly. See Understanding the Mind. Spontaneous bodhichitta Actual bodhichitta Also known as `non-fabricated bodhichitta’, this mind arises spontaneously day and night. At first we generate an artificial, or fabricated, bodhichitta at certain times by contemplating the suffering of others and so forth, and this acts as the foundation for developing actual bodhichitta. Spontaneous great bliss A special bliss that is produced by the drops melting inside the central channel. It is attained by gaining control over the inner winds. See Clear Light of Bliss and Tantric Grounds and Paths. Stages of the path ‘Lamrim’ in Tibetan. A special arrangement of all Buddha’s teachings that is easy to understand and put into practice. It reveals all the stages of the path to enlightenment. For a full commentary, see Joyful Path of Good Fortune. Stupa A symbolic representation of Buddha’s mind. Subsequent attainment The period between meditation sessions. See Joyful Path of Good Fortune. Subtle impermanence See Impermanent phenomenon. Sugata Another Sanskrit term for a Buddha. It indicates that Buddhas have attained a state of immaculate and indestructible bliss. Sukhavati Sanskrit term for ‘Pure Land of Bliss’ or ‘Blissful Land’ – the Pure Land of Buddha Amitabha. Superior being ‘Arya’ in Sanskrit. A being who has a direct realization of emptiness. There are Hinayana Superiors and Mahayana Superiors. Superior intention Motivated by great compassion, the determination to take personal responsibility to release others from suffering and lead them to perfect happiness. See Joyful Path of Good Fortune. Superior seeing A special wisdom that sees its object clearly, and that is maintained by tranquil abiding and the special suppleness that is induced by investigation. See Joyful Path of Good Fortune. Suppleness There are two types of suppleness, mental and physical. Mental suppleness is a flexibility of mind induced by virtuous concentration. Physical suppleness is a light and flexible tactile object within our body that develops when meditation causes a pure wind to pervade the body. Supramundane happiness The pure happiness of liberation and enlightenment. Supramundane path Any path leading to liberation or enlightenment – for example, the realizations of renunciation, bodhichitta, and the correct view of emptiness. Strictly speaking, only Superior beings possess supramundane paths. See Tantric Grounds and Paths. Supreme Emanation Body A special Emanation Body displaying the thirty-two major signs and eighty minor indications that can be seen by ordinary beings only if they have very pure karma. See also Buddha’s bodies and Emanation Body. See Joyful Path of Good Fortune, Tantric Grounds and Paths, and Ocean of Nectar. Supreme Emanation Body An Emanation Body who performs the twelve principal deeds, such as Buddha Shakyamuni, is called a ‘Supreme Emanation Body’. From the point of view of external aspect, such an emanation is supreme, but from the point of view of nature, all beings emanated by a Buddha, however mundane in aspect, are supreme beings. Therefore, we should not infer from the name ‘Supreme Emanation Body’ that there are higher and lower emanations of Buddha. In essence, all Buddha’s emanations are fully enlightened beings. See also Buddha’s bodies. See Joyful Path of Good Fortune, Tantric Grounds and Paths, and Ocean of Nectar..
Sutra The teachings of Buddha that are open to everyone to practise without the need for empowerment. These include Buddha’s teachings of the three turnings of the Wheel of Dharma. Tangkha A traditional Buddhist painting of a holy being. Tängyur The collection of commentaries to Buddha’s teachings that have been translated from Sanskrit into Tibetan. See also Kangyur. Tantra Synonymous with Secret Mantra. Tantric teachings are distinguished from Sutra teachings in that they reveal methods for training the mind by bringing the future result, or Buddhahood, into the present path. Tantric practitioners overcome ordinary appearances and conceptions by visualizing their body, environment, enjoyments, and deeds as those of a Buddha. Tantra is the supreme path to full enlightenment. Tantric practices are to be done in private and only by those who have received a Tantric empowerment. See Tantric Grounds and Paths and Mahamudra Tantra. Tantric bodhichitta A wish to attain enlightenment as a Tantric Deity in order to rescue sentient beings from samsara as quickly as possible. See Great Treasury of Merit and Tantric Grounds and Paths . Tara A female Buddha who is a manifestation of the ultimate wisdom of all the Buddhas. ‘Tara’ means ‘Rescuer’. Since she is a wisdom Buddha, and since she is a manifestation of the completely purified wind element, Tara is able to help us very quickly. Tathagata The Sanskrit for `A Being Gone Beyond’, which is another term for Buddha. Ten directions The four cardinal directions, the four intermediate directions, and the directions above and below. Tenets There are four schools of Buddhist tenets, which are four philosophical views taught by Buddha according to the inclinations and dispositions of disciples. They are the Vaibashika, Sautrantika, Chittamatra, and Madhyamika schools. The first two are Hinayana schools and the second two are Mahayana schools. They are studied in sequence, the lower tenets being the means by which the higher ones are understood. See Meaningful to Behold and Ocean of Nectar. Ten perfections The six perfections as well as the perfections of skilful means, prayer, force, and exalted awareness. See Ocean of Nectar. Thirty-five Confession Buddhas Thirty-five Buddhas who have special powers to purify negativities and downfalls in those who recite their names with faith. See The Bodhisattva Vow. Thirty-seven realizations conducive to enlightenment Any spiritual path that leads to enlightenment. There are seven groups: four close placements of mindfulness, four correct abandoners, four legs of miracle powers, five powers, five forces, seven branches of enlightenment, and eight branches of superior paths. See Ocean of Nectar. Thirty-two major signs Sometimes called the `major marks’. Special characteristics of a Buddha’s form. Examples are the sign of the wheel on the palms of the hands and the soles of the feet. The eighty indications, sometimes called the `minor marks’, include signs such as copper-coloured nails. Three higher trainings Training in moral discipline, concentration, and wisdom motivated by renunciation or bodhichitta. Three Jewels The three objects of refuge: Buddha Jewel, Dharma Jewel, and Sangha Jewel. They are called `Jewels’ because they are both rare and precious. See Joyful Path of Good Fortune. Three principal aspects of the path The realizations of renunciation, bodhichitta, and wisdom realizing emptiness. See Joyful Path of Good Fortune. Three realms The three levels within samsara: the desire realm, the form realm, and the formless realm. The desire realm is the environment of hell beings, hungry spirits, animals, human beings, demi-gods, and the gods who enjoy the five objects of desire. The form realm is the environment of the gods who possess form. The formless realm is the environment of the gods who do not possess form. Beings of the desire realm have powerful delusions, beings of the form realm have more subtle delusions, and beings of the formless realm have very subtle delusions. See also Desire realm, Form realm, and Formless realm. Three times Past, present, and future. See Ocean of Nectar. Three worlds The naga world beneath, the human world above, and the god world on high. See Ocean of Nectar. Torma offering A special food offering made according to either Sutric or Tantric rituals. See Essence of Vajrayana. Training the mind ‘Lojong’ in Tibetan. A special lineage of instructions that came from Buddha Shakyamuni through Manjushri and Shantideva to Atisha and the Kadampa Geshes, which emphasizes the generation of bodhichitta through the practices of equalizing and exchanging self with others combined with taking and giving. See Universal Compassion and Eight Steps to Happiness. Training the Mind in Seven Points A commentary to Eight Verses of Training the Mind, composed by Bodhisattva Chekhawa. For a full commentary, see Universal Compassion. Tranquil abiding A concentration that possesses the special bliss of physical and mental suppleness that is attained in dependence upon completing the nine mental abidings. See Joyful Path of Good Fortune and Meaningful to Behold. Transference of consciousness ‘Powa’ in Tibetan. A practice for transferring the consciousness to a Pure Land at the time of death. See Living Meaningfully, Dying Joyfully and Great Treasury of Merit. Trijang Rinpoche (AD 1901-1981) A special Tibetan Lama of the twentieth century who was an emanation of Buddha Shakyamuni, Heruka, Atisha, Amitabha, and Je Tsongkhapa. Also known as `Trijang Dorjechang’ and `Losang Yeshe’. True cessation The ultimate nature of a mind freed from any obstruction by means of a true path. See Joyful Path of Good Fortune and Heart of Wisdom. True existence Existence in any way independent of conceptual imputation. True-grasping A conceptual mind that apprehends true existence. True origin An action or a delusion that is the main cause of a true suffering. See Joyful Path of Good Fortune and Heart of Wisdom. True path A spiritual path held by a wisdom directly realizing emptiness. See Joyful Path of Good Fortune and Heart of Wisdom. True suffering A contaminated object produced by delusions and karma. See Joyful Path of Good Fortune and Heart of Wisdom. Truth Body ‘Dharmakaya’ in Sanskrit. The Wisdom Truth Body and the Nature Body of a Buddha. The first is Buddha’s omniscient mind, and the second is the emptiness, or ultimate nature, of his or her mind. See Joyful Path of Good Fortune, Tantric Grounds and Paths, and Ocean of Nectar. Tsog offering An offering made by an assembly of Heroes and Heroines. See Essence of Vajrayana. Tummo Tibetan word for ‘inner fire’. An inner heat located at the centre of the navel channel wheel. See Clear Light of Bliss. Tushita ‘Joyful Land’ in English, ‘Ganden’ in Tibetan. The Pure Land of Buddha Maitreya. Both Je Tsongkhapa and Atisha went to this Pure Land after they passed away. See Heart Jewel. Twelve dependent-related links Dependent-related ignorance, compositional actions, consciousness, name and form, six sources, contact, feeling, craving, grasping, existence, birth, and ageing and death. These twelve links are causes and effects that keep ordinary beings bound within samsara. See Joyful Path of Good Fortune and Heart of Wisdom. Twelve principal deeds The principal deeds of a Supreme Emanation Body: (1) descent from Joyful Land, (2) conception in a mother’s womb, (3) birth, (4) mastery of youthful skills and sports, (5) enjoyments with a wife and retinue, (6) ordination, (7) the practice of asceticism, (8) meditation under the Bodhi Tree, (9) overcoming the maras, (10) showing the attainment of enlightenment, (11) turning the Wheel of Dharma, (12) showing the manner of passing away. See Heart of Wisdom. Twelve sources The six powers (the eye sense power and so forth) and the six objects of those powers (visual forms and so forth). See Heart of Wisdom and Ocean of Nectar. Twenty-four holy places Twenty-four special places in this world where the mandalas of Heruka and Vajrayogini still remain. They are: Puliramalaya, Dzalandhara, Odiyana, Arbuta, Godawari, Rameshöri, Dewikoti, Malawa, Kamarupa, Ote, Trishakune, Kosala, Kalinga, Lampaka, Kancha, Himalaya, Pretapuri, Grihadewata, Shauraktra, Suwanadvipa, Nagara, Sindhura, Maru, and Kuluta. See Essence of Vajrayana and Guide to Dakini Land. Two collections The collections of merit and wisdom. See Collection of merit and #Collection of wisdom. Two extremes Buddha explains the middle way by refuting the two extremes: the extreme of existence (that phenomena are inherently existent) and the extreme of non-existence (that phenomena do not exist at all). See Ocean of Nectar. Two truths Conventional truth and ultimate truth. See Meaningful to Behold and Ocean of Nectar. Two obstructions Obstructions to liberation and obstructions to omniscience. Hinayana Foe Destroyers and Bodhisattvas above the seventh ground have abandoned the obstructions to liberation but not the obstructions to omniscience. Consequently, when they are not in meditative equipoise on emptiness, objects appear to them as inherently existent. See also Obstructions to liberation and Obstructions to omniscience.